Seamus Coleman sets his sights on three points when Ireland face Belgium this weekend. Coleman: his cross set up Hoolahan for Ireland's goal. FOUR YEARS AFTER leaving Poland with their tails between their legs, Ireland returned to show Europe that they’re no pushovers — and set their sights on three priceless points against Belgium. Wes Hoolahan’s strike early in the second half put Ireland on course for a famous victory at the Stade de France, before Ciaran Clark’s own goal allowed Sweden to escape with a 1-1 draw. 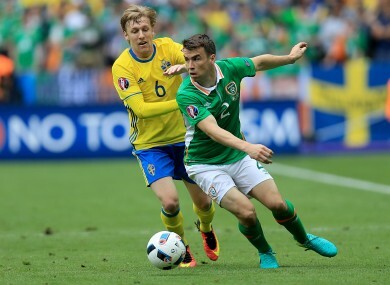 “I wouldn’t say it felt like a defeat,” Seamus Coleman said afterwards. ”It’s a point on the board but it’s disappointing all the same not to see it out. “We were quite dominant for a lot of the game and had a lot chances, but we didn’t get three points. It’s a point on the board and we go into Saturday’s game now and we know that we’re a hard team to beat and not many teams will like playing us. Ireland dominated without finding a breakthrough until two minutes into the second half when Coleman’s cross was met perfectly by Hoolahan, who guided it into the corner of Andreas Isaksson’s net. “I didn’t get the ball out that side as much as I would have liked tonight,” he explained. “Robbie (Brady) had a great game down the left and a lot of balls were coming down that side so when I got it, I just wanted to make something happen and beat my man and put it in the area. All credit has to go to Wes. It was an unbelievable finish. I just put it in the area and he put it away. After limiting Ibrahimovic to nothing more than a few half-chances over the course of the evening, it was cruel fate that Clark was the one to turn the ball past Darren Randolph and allow Sweden to leave with a share of the spoils. “He knows, no one is pointing the finger or anything like that,” Coleman added. “I thought he was brilliant with some unbelievable defensive headers, and to be honest it was a tough one. There was not much (he could have done). The ball came in at pace and he was in that area. It’s a difficult one to defend. Email “'We’re a hard team to beat - not many teams will like playing us'”. Feedback on “'We’re a hard team to beat - not many teams will like playing us'”.